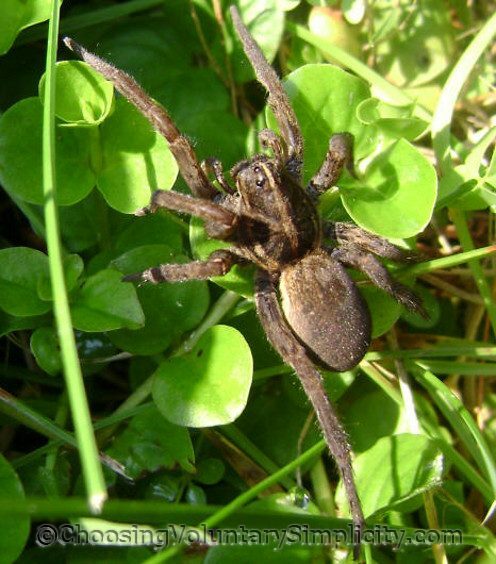 These are wolf spiders, and they are wonderful to have in any garden because they are a natural form of pest control. 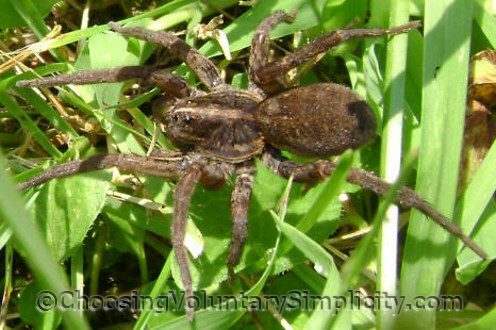 They belong to the family Lycosidae (Greek for “wolf”). I’m not usually bothered by creepy-crawlies, but occasionally we will see a wolf spider that is just so incredibly large it is startling. Wolf spiders have very good eyesight which helps them in hunting their prey, and eight eyes arranged in three rows… there are two medium-sized eyes in the top row, two very large eyes in the middle row, and four small eyes in the bottom row. I was trying to photograph a tiny, tiny toad that was hidden in some very dense ground cover. Imagine my surprise when suddenly this large spider darted out of the vegetation and paused obligingly for a moment on my open hand. I already had the camera focused so I took advantage of the opportunity to take this picture! When I first saw this second spider, which was quite a bit larger than the one that jumped onto my hand, it had newly-hatched babies clinging to its abdomen. As soon as the babies sensed my presence as a threat, they quickly jumped off the mother and disappeared into the vegetation. Wolf spiders inject a venom into their prey, and in humans the venom can cause swelling and pain, so it is a good idea to give these spiders their space… which is why I was not exactly happy to unexpectedly find myself with a handful of spider! We like to have them in our house as they are great pest controllers there as well! I would have so freaked out! I am terrified of spiders and never really saw one up close before your photos. I have to admit they are interesting at a distance. We’re trying to introduce beneficial insects into our garden and we’ve stopped using pesticides. I hadn’t thought of spiders. Great photos and interesting post. Those spiders soooo freak me out. We had wolf spiders in our basement when I was a child, and I would be down there sweeping or doing laundry and all of a sudden there would be one next to me. Scared me to DEATH! Look, I love Nature. I really, really do. And all God’s creatures, big and small. I really, really do. But, when I leave my house for the great outdoors I want to observe things peacefully, not have them give me cardiac arrest. Jo, me too! A big snake would have been worse, though. 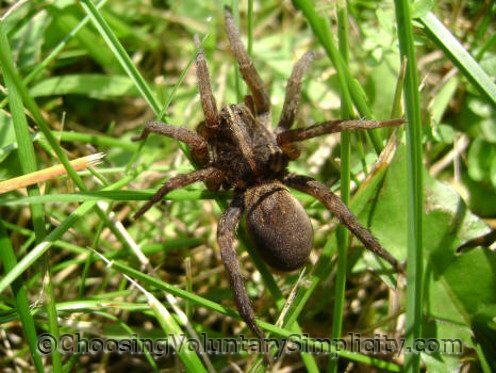 Wolf spiders are neat – what really scares me are the black widows that live around here. I am not generally afraid of spiders (although I do give them their space), but when I see one of those huge black bodies, I go running to get my husband and make him squish it with a hammer before I’ll go anywhere near where I spotted it. I’m such a big baby about widows! Wow! I’m a fan of spiders myself (even the dreaded funnel-web – I definitely give those plenty of space!). It must’ve been cool to see mama spider with her babies. Nice post! I just spotted one in my own garden and got a nice instagram photo out of it. I’m pleased the spider has decided to set up shop in my garden now that I know how beneficial they are (even if he/she did give me a bit of startle at first). In general, I am petrified of spiders. Not the tiny ones, but anything larger than a pencil head. We have widows around where we live, but the worst thing is the huge brown recluse spiders we have. They come in my house when the ground is either too dry or soaked with rain. Once, a large recluse came through my private patio door(we have two patios… this one is outside my bedroom suite) with all her babies on her back! Recluse spiders and Widows are extremely dangerous. I found out if you put a border of crushed oyster shell around the perimeter of your house, no spider or insect will be able to cross as the dust messes with their joints. I’m considering doing this, just for the sake of my family’s protection. 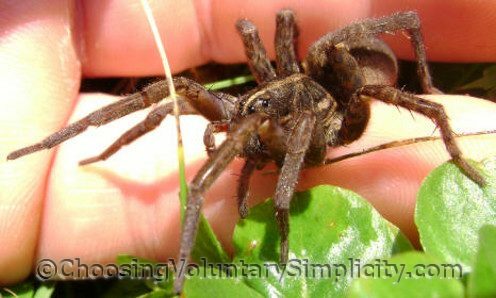 I’m telling you now, if that wolf spider of yours ran up on my hand… the entire little city of Lucedale, MS would have instantly known it… just from my scream!